Memories Lady Evelynn’s childhood hero is home—bitter, hard, tempting as sin. And haunted by secrets. A now-grown Evie offers friendship, but Sir Stephen's cruel rejection crushes her, and she resolves to forget him. Yet when an unexpected war throws them together, she finds love isn’t so easy to dismiss. If only the king hadn’t betrothed her to another. Can be cruel Sir Stephen lives a double life while he seeks the treacherous outlaws who murdered his friends. Driven by revenge, he thinks his heart is closed to love. His childhood shadow, Lady Evie, unexpectedly challenges that belief. He rebuffs her, but he can’t forget her, although he knows she’s to wed the king’s favorite. And deadly When his drive for vengeance leads to Evie’s kidnapping, Stephen must choose between retribution and the love he’s denied too long. Surely King John will see reason. Convict the murderers; convince the king. Simple. Until a startling revelation threatens everything. Another wonderful and exciting book written by this author! What an adventure Stephen and Evie's story brings you on, it had me turning every page wondering what was going to happen next. Stephen is her brother's good friend and always called her "little shadow" because as a young girl, she would follow them everywhere. Now she's a young lady and he is a tortured soul just come back from war. Tension and passion flares between them but both fight it because she's betrothed to someone else and he feels like he's not good enough for her and he's also on the hunt for the man who killed his wife. I also loved all the secondary characters, as well as all the twists and turns in the story. Very much recommend this book. This story was everything I had hoped it would be. I loved the storyline, the characters and the time period. 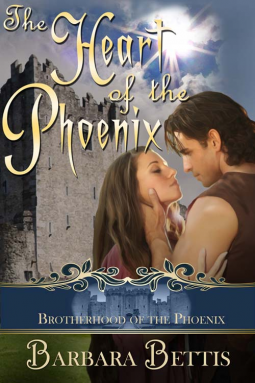 The Heart of the Phoenix is about two childhood friends, Evie and Stephen. They haven't seen each other in some time and now grown their reunion is anything but pleasant. However, fate has thrown them together and what blossoms can only be called. This was a great introduction for A Brotherhood of the Phoenix series. I am excited to see where this series leads in the future.